Carpets can be a beautiful and comforting part of any room, but when they are dull and dirty, they can be a source of embarrassment and stress. Dirt and dust can ruin the appearance of your carpet, and bacteria and contaminants can thrive deep down between the threads of your carpet; releasing allergens and toxins into the air that your family breathes every day. The Environmental Protection Agency recommends that you thoroughly clean your carpet regularly. Unfortunately though, ordinary vacuuming doesn’t thoroughly clean your carpets. While regular vacuuming picks up surface level dirt, they leave the dust, mites and germs behind. Leading Carpet Cleaning employs the use of powerful, truck mounted steam cleaning equipment to make sure your carpets are fresh, clean and safe to live on. Chances are that all pets that spend time indoors are going to have an accident now and again. If you have dog or cat urine or other pet stains and odors, call Leading Carpet Cleaning to rid your home of this embarrassment. We specially treat dog and cat urine and other stains but it is important to call us as soon as possible once you discover the accident in order to get the maximum benefits from our cleaning service. At Leading Carpet Cleaning, stain removal is one of our specialties. If you have a stain that is still visible, call us right away. We handle all kinds of stain removal on carpets, rugs and upholstery including: red wine stains, food stains, pet stains, oil, grease, magic marker, gum, ink, wax and many others. Call us and find out for yourself why we are the stain removal experts! Leading Carpet Cleaning understands that commercial carpet cleaning is different in scope and performance. That is why we have geared ourselves to not only cater to Orange County homes but also to meet the specials needs of office buildings, apartment complexes, restaurants, hotels, retail stores and schools to name a few. We know that commercial carpet cleaning requirements are more stringent than residential. Our commercial clients need to minimize down time and many clients must have the cleaning completed after hours. For your convenience, we work around your schedule. Our cleaning and restoration crews are reliable, hard-working and extremely efficient and we accomplish the maximum amount of cleaning in the shortest period of time. No matter what your type of business or work situation, we have a cleaning process that is right for you. We clean many types of Rugs including hand-made Persian, Chinese, Turkish, Moroccan, Pakistani, and Dhurry rugs, machine-made and area rugs made of wool, silk, cotton, blends, nylon, and olefin. When you call Leading Carpet Cleaning, we first pre-inspect to determine the type of material, condition, dye stability, stains, odors as well as overall soiling to decide the correct cleaning agents to use to achieve the best results. We then pre-vacuum both sides of the rug to help remove loose soil, dust mites, pet dander etc. We also pre-treat stains and heavily soiled areas then lightly agitate to loosen stains and soil. We complete the transformation with a complete steam rinse and extraction to remove soil and stains, leaving your rugs bright and clean. Let Leading Carpet Cleaning get you up off your hands knees with our powerful, fast and effective tile and grout cleaning process. We use a specially developed pre-treatment solution and a high-pressure, hot water rinse to restore and clean all your stone, ceramic tile and grout surfaces. We will give you great results anywhere in your home or office: bathroom floors, showers and tubs, kitchen floors, tiled foyers and entryways, tiled halls, countertops, and more. 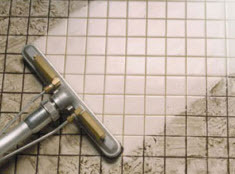 Leading Carpet Cleaning recommends our tile sealing service on your grout after we have cleaned it. This will provide extra protection, making the grout resistant to spills and stains as well as keeping the grout and tile surface looking clean for longer. 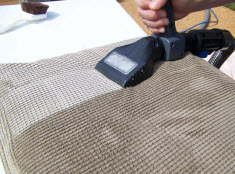 Leading Carpet Cleaning can revitalize your upholstered furniture. Did you realize that upholstery cleaning can make your furniture look new again? Why replace your favorite sofa or chair when you can let our experts restore the beauty and extend the life of all your favorite upholstered furniture? Upholstered furniture is more of a challenge to clean that carpets. Upholstery has a more varied range of delicate materials and our knowledgeable, trained technicians will identify the fabric types of each upholstered piece and determine what upholstery cleaning methods will give your upholstery the best, safest and longest lasting results. With our powerful deep upholstery cleaning system, your sofa, loveseat, arm chair, recliner and ottoman can look near new again. Do not be embarrassed by your upholstered furniture. Just call Leading Carpet Cleaning; we can help make you feel good about your furniture again. CLICK HERE TO LEARN MORE ABOUT OUR UPHOLSTERY & SOFA CLEANING! Mattress Cleaning is extremely important because we spend so much time sleeping on them. Many of us, especially children and babies often wake up with runny noses, watery eyes, headaches and other typical allergy symptoms. In many cases these symptoms are caused directly by dust mites that feed on the dead skin cells we shed while we are sleeping. These unwanted critters are prevalent in mattresses simply because of the amount of time we spend sleeping on them. Our mattresses also collect bacteria, viruses, spores, pollutants and contaminants. Leading Carpet Cleaning can clean the mattresses in your home to ease asthma, bronchitis, sinusitis, rhinitis, conjunctivitis and eczema outbreaks. One of the simplest ways to ensure that your home is a clean and healthy environment is to call Leading Carpet Cleaning to clean your air ducts. This service removes dirt, dust, allergens and countless other pollutants and particles from your ducts to allow for clean and efficient airflow throughout your home. Did you realize that nationally conducted tests by the EPA have shown that indoor air quality is actually more polluted than outdoor air? Leading Carpet Cleaning offers a comprehensive approach to cleaning your entire air duct system using specialized equipment. Our powerful cleaning system delivers the most effective air duct cleaning available. We clean each individual vent, heat registers and cold air returns. CLICK HERE TO LEARN MORE ABOUT OUR AIR DUCT CLEANING SERVICES! Floods or leaks can send water flowing through your home. If you need emergency water extraction in your residence, don’t wait another second. Floods and water emergencies are never planned and time is of the essence. Call a professional team of water damage experts like Leading Carpet Cleaning today, to extract the water from your waterlogged house. We provide you with the best possible water extraction services. Our teams are on-call 24 hours a day to be able to respond to your call as quickly as possible. 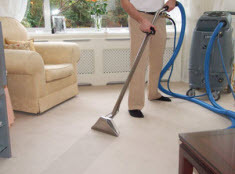 After we extract the excess water, we offer expert carpet cleaning and effective carpet deodorization.